Normally I blog about the stories I cover on CBS San Francisco. 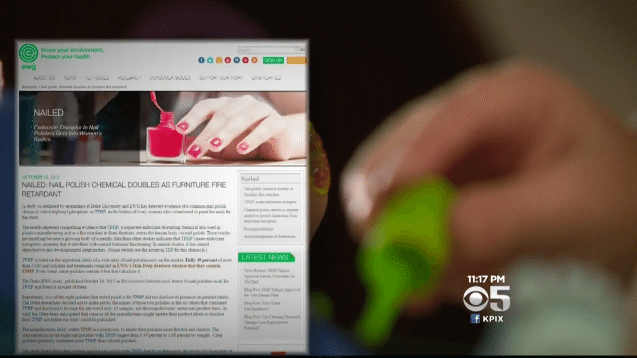 But in the case of this report on nail polish chemicals, it was the other way around. The TV story idea actually came from this NewsMom blog. In true Dad fashion, he demanded they throw away the polish… and right on cue, the girls rolled their eyes. Initially, I felt for the girls. I mean, chemicals in nail polish can’t penetrate your nails, right? Well, according to a joint Duke University-Environmental Working Group study published the following week, wrong! Check out my original blog post for the full story (and how Dad used it to gloat). You can also read more here at CBSSF. If you knew a nail polish chemical was leaching into your body, would it stop you from painting your nails? Don’t worry, you don’t have to stop painting your nails. Check out the Environmental Working Group’s Skin Deep Database to search for polishes that do not contain TPHP.